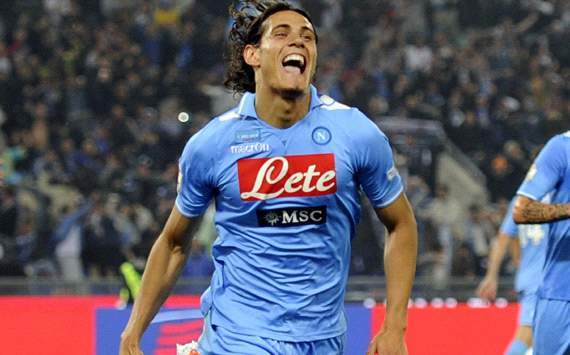 The Old Lady have made the Uruguay international their top priority in the summer transfer window, and Cavani is open to a move to Turin. The attacker is particularly pleased with Antonio Conte's admiration of him, but there are plenty of obstacles hindering a transfer to the Serie A champions. Not only does the forward have strong ties with the Naples side, but the departure of Ezequiel Lavezzi to Paris Saint-Germain has made club president Aurelio De Laurentiis even more reluctant to let go of his star man. De Laurentiis is ready to offer the attacker a new and improved deal worth €3 million per year until 2017 in order to convince him to stay put, and Napoli director Riccardo Bigon is due to meet with Cavani's representatives Pierpaolo Triulzi and Claudio Anellucci either on Thursday or Friday to discuss a new deal. Nevertheless, the 25-year-old forward could earn as much as €5m per season at Juventus, plus the guarantee of playing Champions League football next term. The Bianconeri are slowly running out of patience, though, as they intend to wrap up their transfer business well before the summer window closes. Therefore, Juve are ready to end their pursuit this week if there are no further developments regarding Cavani's plans for the future and Napoli's willingness to sell.